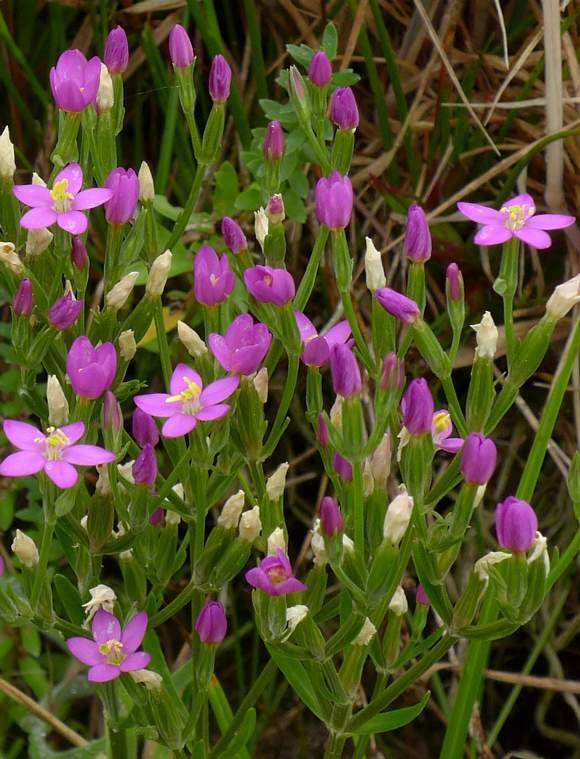 The leaves of Seaside Centaury are strap shaped (wide linear). 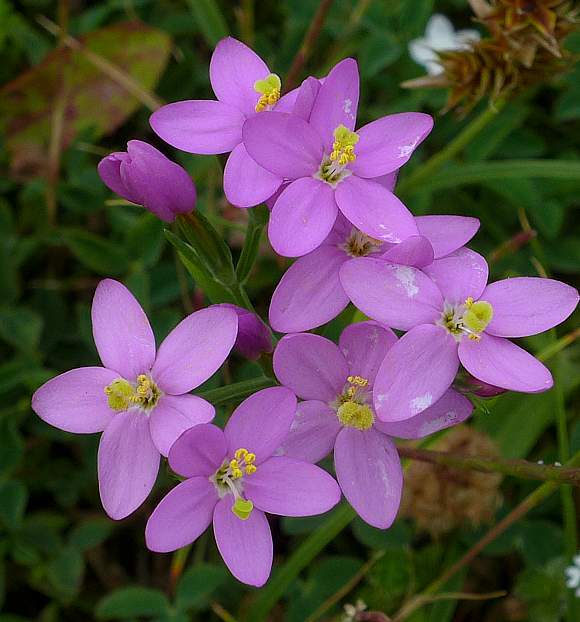 It is shorter than Common Centaury, growing up to just 26cm (rather than up to the 50cm of Common Centaury). The flower inflorescences are rather dense. 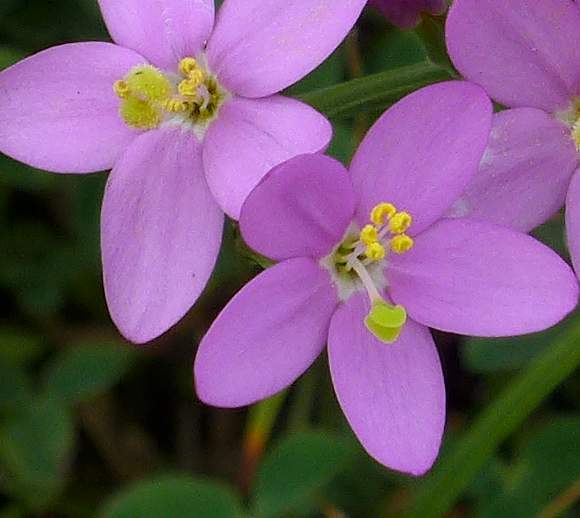 The petals (really corolla lobes) are between 5 and 6.5mm long and are a more bluish-pink than those of Common Centaury. Sometimes the flowers are white. 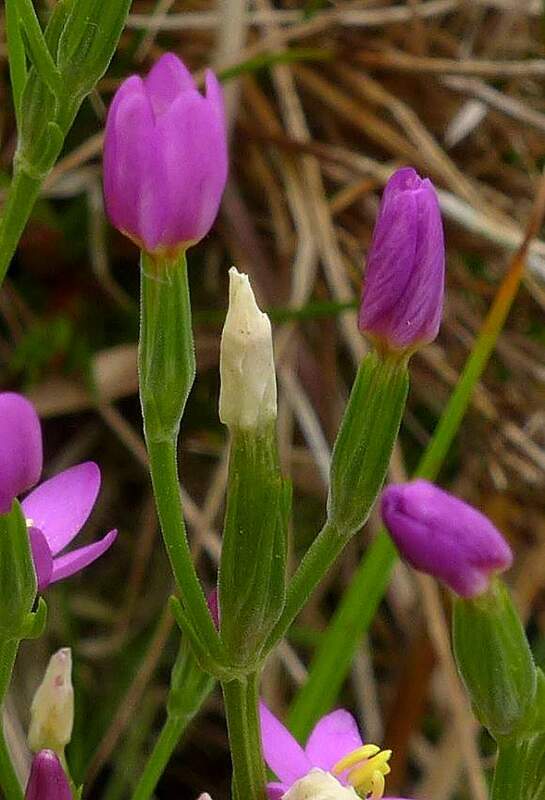 The leaves are still the same distinctive strap-shaped as are those of Seaside Centaury. The identifying feature of this as a hybrid are the 'thick-lips' appearance of the 'open-mouthed' stigma pair. The pale green stigmas on the left have a puffy, grainy dome. The anthers here are twisted like short HSS drill bits or short twisted-candy sticks. Centaurys often do this, but the anthers are not always twisted - see photo above this one (on the flower in the bottom right corner). 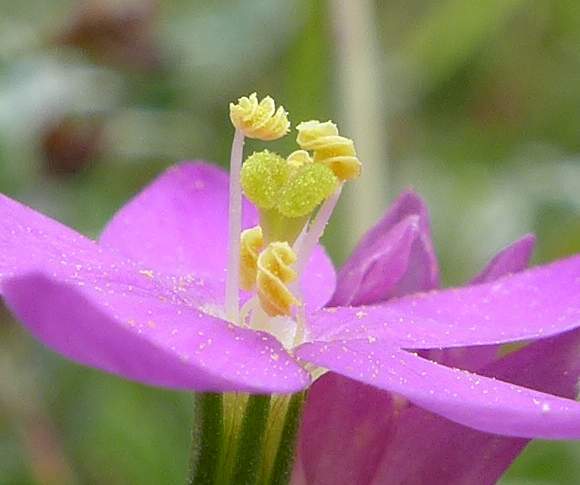 (Lesser Centaury) to produce Centaurium × aschersonianum which was found in South Lancs in 2008 - the lengths of the corolla tube and flower stalk are intermediate between the two parents. 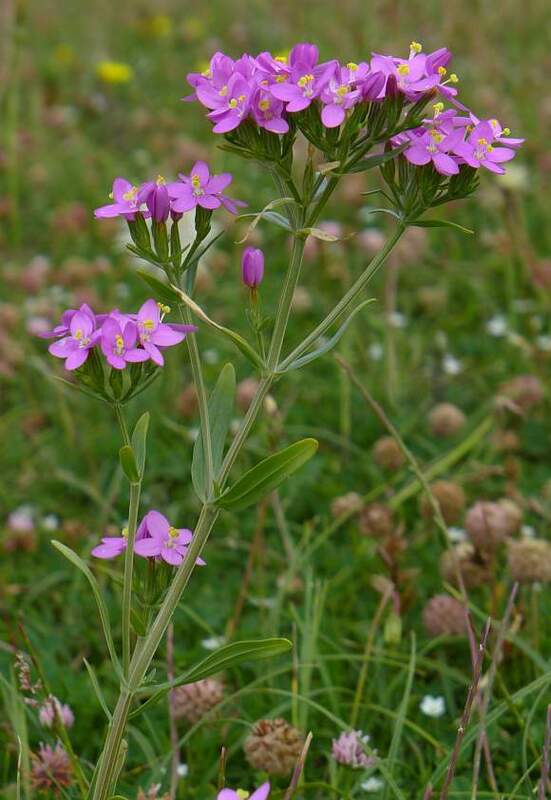 (Common Centaury) to produce Centaurium × intermedium which is found on dunes on the Sefton Coast, Merioneth and Anglesey but which do not produce offspring readily, except on the Sefton Coast where backcrossing to both parents occurs producing fertile offspring. Other crossings are also possible. These complex cross-products are best left to experts to identify. Perhaps it is best to look for Seaside Centaury elsewhere where it is not claimed to hybridise and back-cross etc. 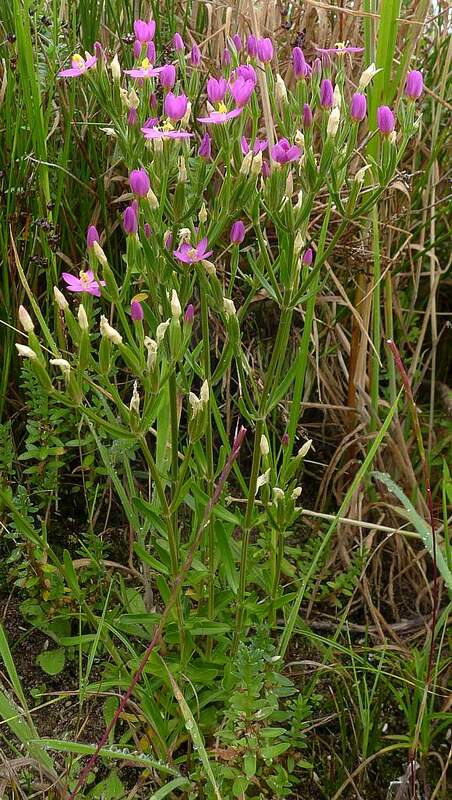 Luckily your Author was with experts who identified this Seaside Centaury specimen on the Sefton Coast. 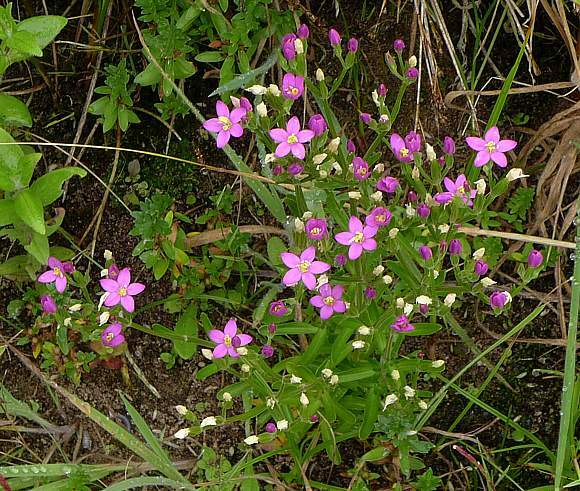 Distinguishing Feature : For Seaside Centaury, the leaf shape (strap shaped - oblong, slightly elliptical with sides almost parallel (they bulge outwards slightly) is exclusive to Seaside Centaury and is diagnostic: the leaves on the stems are narrow oblong-elliptical and with the sides almost parallel. The apex is round to obtuse. The plant is biennial and erect. It is found not only on the Sefton Coast (where it can hybridise) but also on sandy turf and coastal sand dunes from Northern Britain to South Wales and North-east Yorkshire and in County (London)Derry.